Discussion in 'iPhone and iPad Games' started by SunHpp, May 22, 2010. New : Joystick-like controls ! Android is a Fast Paced LodeRunner game with many more features : - Large levels in landscape - musics - Horizontal left/right bumpers - customs levels for endless of fun Android is a 2D platformer very similar to Brøderbund’s classic Lode Runner. The goal is to guide an android around each level, collecting every bag of gold on the screen while avoiding roving enemies and collecting bonus fruit. As with Lode Runner, gameplay involves running, climbing, hanging, and dropping bombs in order to dig holes or trap enemies. All is done via touchscreen controls. Check this great pixelart side-scrolling platformer game with features like jumps, teleporters, etc. Android is a 2D platformer very similar to Brøderbund’s classic Lode Runner. The goal is to guide an android around each level, collecting every bag of gold on the screen while avoiding roving enemies and collecting bonus fruit. 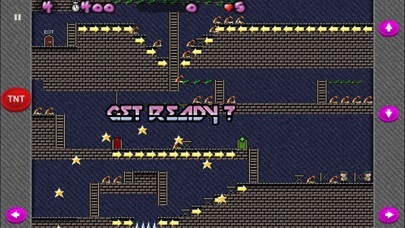 As with Lode Runner, gameplay involves running, climbing, hanging, and dropping bombs in order to dig holes or trap enemies. All is done via touchscreen controls.